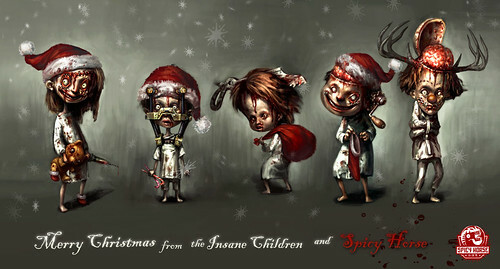 Merry Christmas from the Insane Children and Spicy Horse! Ever wonder why the Insane Children are insane? Mad looks, twitchy fingers, exposed brains – all symptoms of playing too much DexIQ! DexIQâ€™s hook is that it tests not only your IQ, but your dexterity, by making you play two different games at one time, with the screen split down the middle. Itâ€™s the iPhone equivalent to patting your head and rubbing your stomach at the same time. I canâ€™t stress enough, if youâ€™re interested at all in puzzles and games that activate the brain, you should be putting DexIQ onto your iPhone as we speak. Itâ€™s a little short on the available amount of challenges, but for under $1, you absolutely cannot go wrong. I donâ€™t think Iâ€™ve had so much fun going through an IQ test, probably because it has the game tag attached to it. So at times I am squashing bugs on one side while running away from a ghost on the other. Or maybe I would be calculating sums while floating through clouds simultaneously. Our little brain game also scored a 5 out of 5 rating in that review! News about DexIQ and the launch of Spicy Pony has spread far and wide: Blue’s News, Avault, Buzzapp, Videogame.it and Hybrid (Korea). The Spicy Pony team is already working on improvements to the original challenge – expect a release sometime after the New Year. In the meantime, be sure to check out the brain game everyone is going insane for. DexIQ on the app store. PS – be sure to comment on things you’d like to see improved in future versions. We’re listening! For some time now I’ve been fascinated by the idea that we might one day “jack in” and interface directly with the content on our computers. I feel strongly that by creating alternate realities (and replacing our work day commutes and material item purchases with digital equivalents) we might actually save the world. I think game makers are,without really thinking about it, laying huge amounts of the foundation that will make virtual reality a real-world reality. So when I read “scientists extract images directly from brain” I got really excited. We already have the input – ways of pumping digital info directly into the brain. With this, we can have output. And we’re on our way to a truly interactive VR experience. Cool stuff.